Regular Babyologists will know just how much we adore Etsy. From the marvellous handmade fashions to the beautiful handcrafted toys and exquisite nursery artworks, we love it all. Now, it seems, the feeling is mutual. 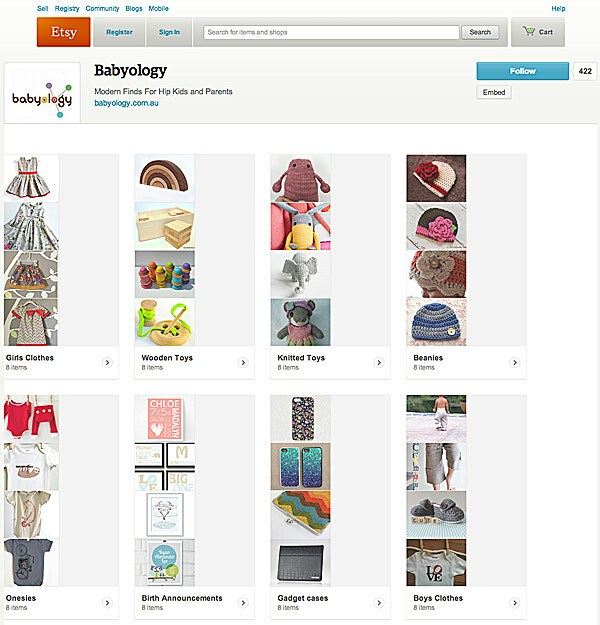 Babyology has been invited to be one of the first design blogs anywhere in the world to share our Etsy love with everyone via Etsy Pages. What that means is you – and every other parent around the world who appreciates the handcrafted and beautiful things in life – can keep track of all the stunning, quirky and downright covetable things we find on Etsy for babies, children, mums and dads simply by following our guide on Etsy Pages. Stop in to see what has caught our eye already, and check back often, because an office-wide Etsy addiction means we’ll be adding amazing new things to Babyology on Etsy all the time.